Most of us have been taught from childhood not to trust our feelings, not to express ourselves truthfully and honestly, not to recognize that at the core of our being lies a loving, powerful, and creative nature. We learn easily to try to accommodate those around us, to follow certain rules of behavior, to suppress our spontaneous impulses, and to do what is expected of us. Even if we rebel against this, we are trapped in our rebellion, doing the opposite of what we’ve been told in a knee-jerk reaction against authority. Very seldom do we receive any support for trusting ourselves, listening to our own sense of inner truth, and expressing ourselves in a direct and honest way. When we consistently suppress and distrust our intuitive knowingness, looking instead for authority, validation, and approval from others, we give our personal power away. This leads to feelings of helplessness, emptiness, a sense of being a victim, and eventually anger and rage — and, if these feelings are also suppressed, to depression and deadness. We may simply succumb to these feelings and lead a life of quiet numbness. We may overcompensate for our feelings of powerlessness by attempting to control and manipulate other people and our environment. Or we may eventually burst forth with uncontrolled rage that is highly exaggerated and distorted by its long suppression. None of these are very positive alternatives. The true solution is to re-educate ourselves to listen to and trust the inner truths that come to us through our intuitive feelings. Following our inner guidance may feel risky and frightening at first, because we are no longer playing it safe, doing what we “should” do, pleasing others, following rules, or deferring to outside authority. To live this way is to risk losing everything that we have held on to for reasons of external (false) security, but we will gain integrity, wholeness, true power, creativity, and the real security of knowing that we are in alignment with the power of the universe. In suggesting that our intuition needs to be the guiding force in our lives, I am not attempting to disregard or eliminate the rational mind. The intellect is a very powerful tool, best used to support and give expression to our intuitive wisdom, rather than as we often use it — to suppress our intuition. Most of us have programmed our intellect to doubt our intuition. When an intuitive feeling arises, our rational minds immediately say, “I don’t think that will work,” “nobody else is doing it that way,” or “what a foolish idea,” and the intuition is disregarded. As we move into the new world, it is time to re-educate our intellect to recognize the intuition as a valid source of information and guidance. We must train our intellect to listen to and express the intuitive voice. The intellect is by nature very disciplined and this discipline can help us to ask for and receive the direction of the intuitive self. What does it mean to trust your intuition? How do you do it? It means tuning into your “gut feelings” — your deepest inner sense of personal truth — in any given situation, and acting on these feelings, moment by moment. Sometimes these “gut messages” may tell you to do something unexpected or inconsistent with your previous plans; they may require that you trust a hunch that seems illogical; you may feel more emotionally vulnerable than you are used to feeling; you may express thoughts, feelings, or opinions foreign to your usual beliefs; you may follow a dream or fantasy, or take some degree of financial risk to do something that feels important to you. At first you may fear that trusting your intuition will lead you to do things that seem somewhat hurtful or irresponsible to others. For example, you may hesitate to break a date, even though you need time for yourself, because you fear hurting your date’s feelings. I’ve found that when I really listen to and trust my inner voice, in the long run, everyone around me benefits as much as I do. People may sometimes be temporarily disappointed, irritated, or a bit shaken up as you change your old patterns of relating to yourself and others. But this is usually because as you change, the people around you are automatically pushed to change as well. If you trust, you will see that the changes are also for their highest good. (If you do break that date, your friend may end up having a wonderful time doing something else.) If they don’t want to change, they may move away from you, at least for a while; therefore, you must be willing to let go of the forms of relationship you have with people. If there is a deep connection between you, chances are good that you will be close again in the future. Meanwhile, everyone needs to grow in his or her own way and time. As you continue to follow your path, you will increasingly attract people who like you as you are and relate to you in a way that feels honest, supportive, and appreciative. Shakti Gawain is a pioneer in the field of personal growth and consciousness. 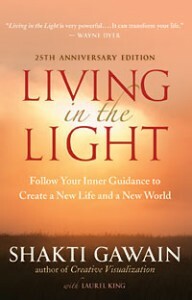 Her bestselling title Living in the Light was just published in an updated and revised 25th Anniversary edition. Along with Marc Allen, Gawain co-founded New World Library in 1977. She lives in Marin County, California. Visit her online at http://www.shaktigawain.com.